One of the most important reasons which makes Apple a standout amongst competitors is its inter-device compatibility between various products. Be it iPhone, Mac or Apple TV each and every device works seamlessly well with each other. Keeping all this in consideration, were you aware about the fact that we could use Mac to make phone calls as well? Yes, you heard it right. Just like other Apple devices Mac and iPhone work seamlessly smooth with each other. But for making phone calls you just need to make sure that both the devices are near each other. Like they must be in the same room so that the network doesn’t get interrupted through walls. So, if you want to try this little experiment let’s proceed further. How to Make Phone Calls from Mac via iPhone? We’ll break this process into two parts to make it simpler for you to understand. See Also: How To Disable Location Tracking On MacOS High Sierra? If you’re busy doing some important stuff on your Mac and you don’t want to be disturbed with annoying notifications, Apple’s environment makes this pretty easy for you. NOTE: You just have to make sure that both the devices are connected on the same WiFi network and synced through the same Apple ID account. In case anybody calls you on your iPhone, you’ll get a small notification on the top right corner of your Mac’s screen. To receive a phone call, simply tap on “Accept”. Once the call is picked you’ll be able to talk with the help of Mac’s inbuilt headphone and Mic. At any time if you wish to switch and continue the call on your iPhone, tap on your iPhone’s screen and hit on the green bar at the top. Doing this will disconnect the call from your Mac and it will be diverted to your iPhone. Launch the Facetime app on your Mac and look for the contact whom you wish to call. Tap the phone icon next to the contact and select the phone number you want to dial under Call Using iPhone. This will initiate a phone call on your Mac and you can easily converse via Mac’s inbuilt headphones and Mic. If you want to call an unknown number who’s not on your existing contact list, simply tap on the search bar and manually type the phone number. P.S. Whenever you’re trying this just make sure both the devices (Mac and iPhone) are in the same room. 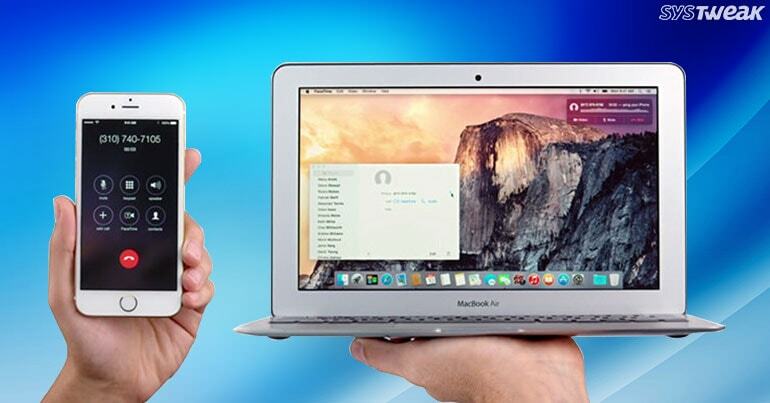 Apple uses Bluetooth Low Energy Protocol which enables this feature on your Mac and iPhone. The approximate range is about 30 feet but you just have to make sure that the network is not being interrupted via walls or wires. So, now make calls right away while working on your Mac and keep your life simple!